In my last blog entry, Cores vs Threads: Util Difference...Part 2 I analyzed seven data sets to discover if there is a difference between calculating OS CPU utilization based on v$osstat CPU cores versus running vmstat. All but one sample set (that AIX sample set, AG1) clearly showed there was no significant difference. The only concern I have is none of the sample sets were gathered from a system with the CPU utilization greater than 65%. I would like to see some sample sets with a CPU constrained system. It is possible if the utilization differences are highly skewed and the residual slope is not flat (discussed below), the utilization difference (i.e., the gap) could become increasingly larger. The week after I posted that entry, a willing participate (who I'll call AB) gathered and sent me data from a production Oracle Solaris system that peaked at 100% CPU utilization! So I was very excited to analyze the results. You can view the entire results in a single PDF file by clicking here. The correlation between the two utilization sources is a jaw-dropping 0.99985. The statistical hypothesis test resulted in a p-value of 0.815 clearly exceeding our threshold of 0.05 and forcing us to accept the null hypothesis that the two sample sets are not statistically different. 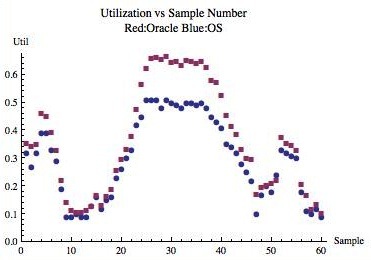 Figure 1 above shows the Oracle utilization as red squares and the vmstat utilization as blue dots...but you can't see any blue dots because the Oracle red squares are in front of them...the utilizations are visually exactly the same! Even with the utilization at 90% and above, there is no visual difference...amazing. 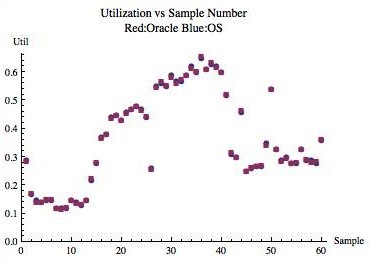 Figure 2 above is the residual graph plotting the utilization difference versus Oracle utilization. Notice the difference is usually less than 1% and just as important the error does not increase as the utilization increases (which is common when forecasting Oracle performance). In fact, the slope of the trend line is 0.00285....flat. What this means is detailed in the previous blog entry; search for "trend line slope". The AB1 data set clearly showed there was no real difference in the utilization calculations. This is yet another data set demonstrating in many environments using v$osstat and CPU cores to calculate CPU utilization is a valid alternative to running vmstat. The best way to determine if it's OK in your environment is to simply gather a little data and plot some points. I still would like to see more AIX data sets. I suspect (and the single AIX AG1 data set demonstrated this) the way AIX calculates utilization is different than using v$osstat and CPU cores. And as the CPU subsystem gets busier, the utilization difference increases. More data is needed before I can say more about this though. Like I mentioned in my previous blog entry, I think the more intriguing question is why can there be a difference in utilization calculations. I would have posted that entry his week, but teaching last week in Boston (see pictures here) destroyed my voice and I was so tired at night I had no time to complete the entry...so stay tuned! 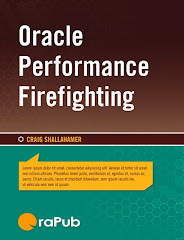 If you enjoy my blog, I suspect you'll get a lot out of my courses; Oracle Performance Firefighting and Advanced Oracle Performance Analysis. I teach these classes around the world multiple times each year. For the latest schedule, click here. I also offer on-site training and consulting services. P.S. If you want me to respond to a comment or have a question, please feel free to email me directly at craig@orapub .com. I use a challenge-response spam blocker, so you'll need to open the challenge email and click on the link or I will not receive your email. Another option is to send an email to OraPub's general email address, which is currently orapub@comcast.net. This is so typical... What I think will be a casual research project ends up being so much more. I hope you find this blog entry very enlightening and useful. Understand how a mismatch could be possible. This is a fairly long entry; full of experimental and analysis details. If you want to skip all the details, just scroll down to the final section, "Summary" and read only that. The CPU cores from v$osstat can be determined by taking the largest non-thread CPU count-type statistic value. If cores are not mentioned, then use a CPU statistic. I know this is strange, but I've never seen this approach fail (yet). When I refer to "OS utilization," I am referring to the average CPU utilization gathered over a time interval using the OS command vmstat. If these formulas seem strange, please refer to Part 1 of this series. To accomplish my goals I needed utilization related data from real Oracle production systems. So I created a data collection script and asked a bunch of DBAs to run it on their production systems. The script is nothing special. It's a simple shell script with some awk and greps, a little math and there is even a while loop. The inputs are the number of samples to collect and the snapshot interval time. I gathered and calculated the CPU utilization two different ways. First, based on the busy_time and CPU cores from the data source v$osstat. Second, I also gathered the CPU utilization from the OS using vmstat. The results for each sample were written to an output file and lots of details were written to a log file as well. I wrote the script to work on Linux. It is very well documented and explains what is likely to need modification to work on any Unix-like OS. Click to view the Linux version. I sent emails to a couple folks who commonly will collect data for me from their production systems. I also sent about fifty other emails to some students from my recent classes (pictures). From my thinking, I had a great response. As you personally know DBAs are extremely busy plus I'm asking them to run a script in one of their production systems...it's a lot to ask. But I did get some data and it is goooood data. As I mentioned, my analysis is based on seven sample sets from HPUX, Linux, and AIX environments. There were no outliers and no data was removed. All the data was placed directly in the Mathematica Notepad and you can view the data by simply looking at the resulting PDFs (see below). Each sample set consisted of 60 samples, so I was well above my chosen minimum of 30. Each sample interval was 15 minutes; long enough to remove any significant collection timing error but not too long to miss significant utilization swings. By the way, I do a lot of these types of experiments. If you want to participate, just send me an email (start by sending to orapub@comcast.net). If you desire, I will keep you anonymous, which I have done with everyone in this experiment. To analyze the data, I used Mathematica. As you can see by looking at the output, it's very clean and allows me to document the analysis in detail within the Mathematica "Notebook." All the data has been placed into the single Mathematica notebook. The data is at the bottom of the notebook and it is documented with specifics such as the OS and number of cores and threads. I also provide the participate's reference code (so I can go back and reference all the emails, raw data files, etc.). The analysis notebook contains five main sections; Background and Purpose, Data Loading, Basic Statistics, Utilization Difference Analysis, and the Experimental Data. You can view each of the analysis results, on-line in a PDF file, by clicking on the links below. 1. AG1. AIX, 16 cores, each with 2 threads (32 total threads). 2. AG2. Linux, 4 cores, each with 4 threads (16 total threads). 3. GO1. HPUX, 3 cores, each with 2 threads (6 total threads). 4. LZ1. HPUX, 32 cores, each with 2 threads (64 total threads). 5. LZ2. HPUX, 32 cores, each with 2 threads (64 total threads). 6. NN1. Solaris, 4 cores, each with 2 threads (8 total threads). 7. RB1. Linux, 8 cores, not sure if threads are being used. To download the "analysis pack" (in a single zip file) which contains all the above analysis PDFs, Mathematica notebook (think of the notebook as the source file), and the data collection script, click here. Figure 1 below is a summary of the results. Figure 1. Summary of the analysis. Here is a short explanation of each figure column. Code is the code to identify the sample set and to keep the data provider anonymous. OS is the operating system. Cores (total) is the total number of CPU cores. Threads (total) is the total number of threads. Samples is the number of experimental sample collected and used in the analysis. Interval (sec) is the sample duration for every collected sample. Utils Correl is the correlation coefficient relating the relationship strength between the two utilizations; v$osstat core based and OS vmstat based. A high correlation indicates when one of the utilizations changes so does the other. A correlation coefficient in the 0.90+ is very high, so as you can see all of our samples showed a staggeringly high correlation. Util Max is the maximum utilization of any sample value. Avg Util Diff is the Oracle utilization (v$osstat core based) minus the OS utilization (vmstat). Throughout this analysis, the difference is always calculated this way. Hypo Test is the result of hypothesis test (alpha=0.05), testing if the utilization differences are enough indicate they came from different sources, such as different utilization calculations or even a different database server. All but one of the samples easily passed the hypothesis test. There is more information about the hypothesis test below and also in the Mathematica notebooks. Histogram Notes are simply short observations regarding the histogram of the utilization differences. A nice looking "bell curve" indicates the error hovers around the mean and there is not a significant and harmful trend. Util Scatter Gap shows the utilization values for all of our samples; both Oracle based and OS based. Therefore, there are 120 datapoints on the graph. This graph allows us to quickly and visually tell if there are significant differences in the utilization calculations and also when they occurred. For example, we can visually tell if these gaps increase as the utilization increases. That is a harmful trend we will want to know about. 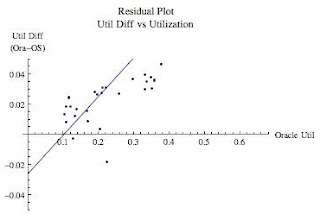 Residual Slope is the slope of the linear trend line based on the utilization error (i.e., difference) as the y-axis and the Oracle based utilization as the x-axis. This is another method to spot a harmful trend. A harmful trend example is when the utilization increases so does the difference between the two utilization sources. If the slope is zero (completely flat) this means regardless of the utilization the difference is always the same. The line could be flat but above the zero y-axis, which indicates while the utilization difference is the same regardless of the utilization, the Oracle utilization is always greater than the OS based utilization. Residual graphs are a powerful way to look for harmful trends. I could write on and on about the individual samples, but it's not necessary (thankfully). All but one of the samples (AG1) are very similar. 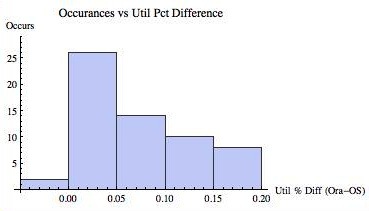 All the non AG1 samples visually and mathematically indicate while there is a little difference in the utilization calculations, it is very small, consistent over the gathered utilization range, and the difference in the utilizations is normally distributed. The only concern I have is the none of the sample sets were gathered from a system with the CPU utilization greater than 65%. I would like to see some sample sets with a CPU constrained system. It is possible if the utilization differences are highly skewed and the residual slope is not flat (discussed below), the utilization difference (i.e., the gap) could become increasingly larger. This stresses the importance of understanding how utilization is calculated and what this truly means for our Oracle production systems. While I will write below about the practical value of the analysis, the How Can This Be? will be posted in my next entry...it's just too much information for a single blog entry. I'm going to review in detail two sample sets. The two are very different and will make a nice contrast; LZ1 and AG1. I chose to focus on the LZ1 sample set because the CPU subsystem is relatively active (max 66%), it's a massive database server (64 cores), and is HPUX based. You can view the PDF analysis file by clicking here. But I have extracted some of the graphics and show them below. First, there is a strikingly strong and positive correlation (1.000) between the two utilizations. This means when one of the utilizations increases so will the other...nearly always. 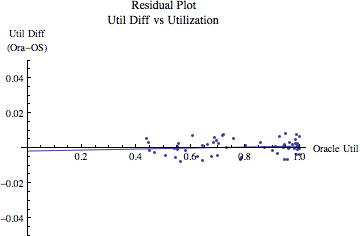 So while there is a slight difference between the two utilization calculations, they are very highly correlated. This slight difference in utilizations is indeed small...infinitesimal is a better word. The average difference is only 0.00028 of a percentage point...basically no difference. A tiny utilization calculation difference may not seem or feel significant, but statistically is might be too much to indicate the data sets are the result of two different calculations. This is another of saying we want to test if our two sample sets are statistically different. If they are different, then we know any difference is not caused by randomness. The difference could be caused any number of things, but not randomness. But itʼs a little more complicated then is usual... We canʼt expect all the Oracle utilization data values to be normally distributed. Think about it; there could easily be two clusters of values, say around 20% and 50% busy. This would result in a non-nomal distribution of utilization values. The same is true for the vmstat utilization data values. Because of this non-normality, we canʼt perform a simple t-test. So this is what I did: I created a new sample set based on the differences between each collection method (one value for Oracle based utilization and the other value from vmstat). If the new "differences" sample set is normally distributed, than any differences in the samples (e.g., S51-S1) do exist, the difference can attributed to randomness. On the flip-side, if the new sample set is not normally distributed, we know the utilization differences are not caused by randomness...but by something else. Back to the LZ1 analysis: I performed a significant test (alpha=0.05) to see if the "differences" sample set is so different that randomness could not account for the difference and therefore the difference was caused by something else...like perhaps different utilization calculations. As expected, the two sample sets are similar enough (Anderson-Darling test, p=0.950) to indicate any difference is caused by randomness. Figure 2 above is the histogram based on the "differences" sample set. The histogram doesn't look perfectly normal; it's kind of flat near (negative kurtosis) the top and the left tail is "fat." However, it's not that bad (I realize that's not real scientific.) What I like to see if the error tappers off at the tails, so that it is centered around the average...so we're close. Figure 3 above is a scatter plot of the two utilizations, not the "differences." 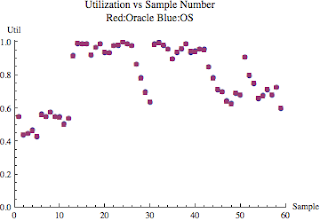 All 60 samples are represented and for each sample there is an Oracle utilization point (red square) and an OS utilization point (blue circle). In the figure it is difficult to distinguish the two points because they are almost the same! This means the utilization calculations are pretty much the same. But even more important; the gap is very consistent the same regardless of the sample or the utilization. 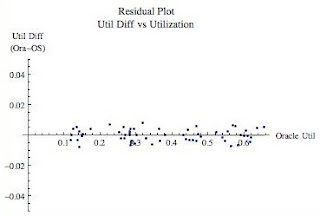 Figure 4 above is known as a residual plot and is a phenomenal way to spot trends in the error, that is, the differences in the utilization calculations. It is common for mathematical models to work wonderfully at lower utilizations but get increasingly poor as the utilization increases. (We tackle how to remove the error in my Oracle Forecasting and Predictive Analysis course.) The residual graph is one way to visually help us detect if this is occurring. For our purposes, we want to check visually again (like we did with the scatter plot above) if the utilization difference is greater based on the utilization. If the trend line of the residuals is flat (and it is with a slope of 0.0002331) then the utilization difference does not change based on the utilization...for the samples we selected. You probably can't even see the trend line because it is virtually on the x-axis. I could have made the y-axis range smaller and effectively stretch the graph top to bottom, but I want to fair comparison with the AG1 data set I'll detail below. To summarize sample set LZ1, both utilization calculations always resulted in nearly the same value, the difference did not change as the utilization increased, and the hypothesis test showed the differences in the utilization can be explained by randomness. Based on this information, I am comfortable using either utilization calculation until signifiant CPU queuing begins, which will occur at around 85%. Then I would gather additional data and re-analyze. There is a strikingly strong and positive correlation between the two utilization sources. This means when one of the utilizations increases so will the other...nearly always. So while there is a near 7% difference in the utilization sources, they are still very highly correlated. A 7% difference may seem or feel significant, but statistically is might not be a big deal and could have been caused by randomness. Just as with the LZ1 sample set, I performed a significance test (alpha=0.05) to see if the utilization difference in each sample pair are significantly different. As we suspected, statistically speaking there is significant difference (Anderson-Darling test, p=0.040). This means the difference can't be explained purely by randomness and something else is causing the difference...perhaps it's the difference in utilization calculations or something else. 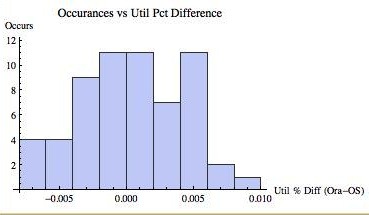 Figure 5 is a histogram of the utilization differences from our sample. Notice on all but two occasions, the Oracle utilization was higher than the OS (vmstat) utilization. We can also visually see the utilization differences are not normally distributed but heavily skewed to the right (skew>0, skew is positive)...in fact it looks log normal. Figure 7 above is the residual plot showing as the Oracle utilization increases, so does the difference between the utilization calculations. Compared to the other sample residual graphs, the slope looks shockingly steep! The trend line may not appear to match the data. It is because all the data is not shown to allow for a direct and fair comparison with the other sample sets (e.g., Figure 4 above). Let's take a look at what this really means. The linear trend line slope is 0.2563. This means for every single percentage of Oracle utilization increase there is an additional 1/4 of a percentage point difference in the utilization calculations. Figure 7 shows when the Oracle utilization is around 35% (i.e., 0.35) there difference in utilizations is around 3%. If we extend the line to where the Oracle utilization is 60%, the difference in utilizations is expected to be around 13% (just plug the Oracle utilization number into the trend line formula, shown on the analysis PDF file). That is still not horrible, but not great either. The question now becomes, which utilization is the "real" utilization. This is the subject for my next blog entry. To summarize sample set AZ1, all our tests indicate there is a significant utilization calculation difference between Oracle core-based and OS based CPU utilizations. When the utilization peaked, the Oracle based calculation was around 10% greater than vmstat showed and this difference is expected to increase as the utilization increases! So we had better decide which utilization source to use or we and everyone we work with could be confused. In the next blog entry I'll drill down into this topic. If you are concerned about which utilization method to use, don't worry...do a little analysis. You don't need to do a full-on analysis like I did. Just gather some data (you can even use my data collection script) and create a scatter plot like I did in Figure 3 and Figure 6. If you see a difference of more than around 5% then you may want to determine why the difference exists and also which method is relevant for your work. Can we use v$osstat as a source to reliably calculate OS CPU utilization? Absolutely. Can the v$osstat core based utilization differ significantly from vmstat? Absolutely. How do I know if I need to be concerned? As I mentioned directly above, collect some data and do a quick analysis. If you'd like, I can help QA your conclusions.